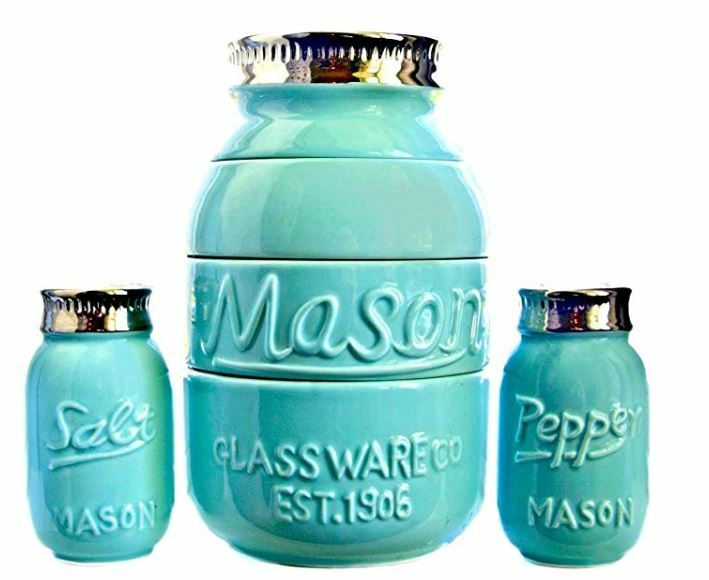 How cute is this Mason Jar Measuring Cups with Salt and Pepper Shaker for $14.99. -THE CLASSIC MASON JAR LOOK NOW UPDATED FOR YOUR MODERN BAKING NEEDS: The cooking upgrades mason jar baking set brings retro colors and designs to your kitchen table with and updated sense of modern appeal. -CRAFTED OF HIGH QUALITY CERAMIC: This set offers 1 salt shaker, 1 pepper shaker, and a stackable measuring cup with 1 cup, ½ cup, 1/3 cup, and ¼ cup dry measurements that stack together beautifully when not in use. Dishwasher safe. Comes shipped in protective poly foam box. -100% SATISFACTION GUARANTEED: No worries, no hassle, order your set Prime today and have it at your door or gift it for a loved one. If you don't love it, return it. No problem.